In the San Francisco Bay Area, where the ground often shakes, the term "earthquake weather" is part of the vernacular. This idea that a certain type of weather might signal a major seismic event comes up in conversation—especially on a day when the temperatures are soaring, the sky lurid and the air eerily still and awash in a light haze. Today in sf bay feels like what superstitious people call "earthquake weather"
But the problem is that earthquake weather is total nonsense, according to most seismologists and meteorologists alike. "Statistically there are equal distributions of earthquakes in cold weather, hot weather, rainy weather and dry weather," says Fred Pollitz, a research geophysicist with the U.S. Geological Society office in Menlo Park. This belief that distinctive weather may foreshadow a major seismic event dates back for centuries, and Null says "some of the postulation about warm 'earthquake weather' goes back to Aristotle describing earthquakes as being the result of warm winds being released from underground caverns." References to earthquake weather in the past 100-plus years continue to associate the term with atmospheric conditions that are calm and hot. Cornhill Magazine, a popular publication during Victorian times, says in an 1884 article that during "earthquake weather" there's a "ominous hush in the air." A 1919 article in the San Francisco Chronicle says "earthquake weather" is applied to "a heavy, oppressive feeling in the air; heat, calm little cloud, and more or less haze." Some say the 1989 Loma Prieta earthquake cemented this definition into the Bay Area psyche. The trembler rocked the Bay Area with devastating force on October 17—a day when winds were nonexistent and the high in Downtown San Francisco hit 81 degrees. "I've noticed this with weather, people's recollections are skewed by personal events and the most recent memory is how they tend to remember things," Null says. "Bay Area residents probably remember the '89 earthquake, a day when it was hot and still." In other words, on those days when the weather is hot and still in S.F., which are quite rare, people start wondering if the '89 catastrophe is going to repeat itself. 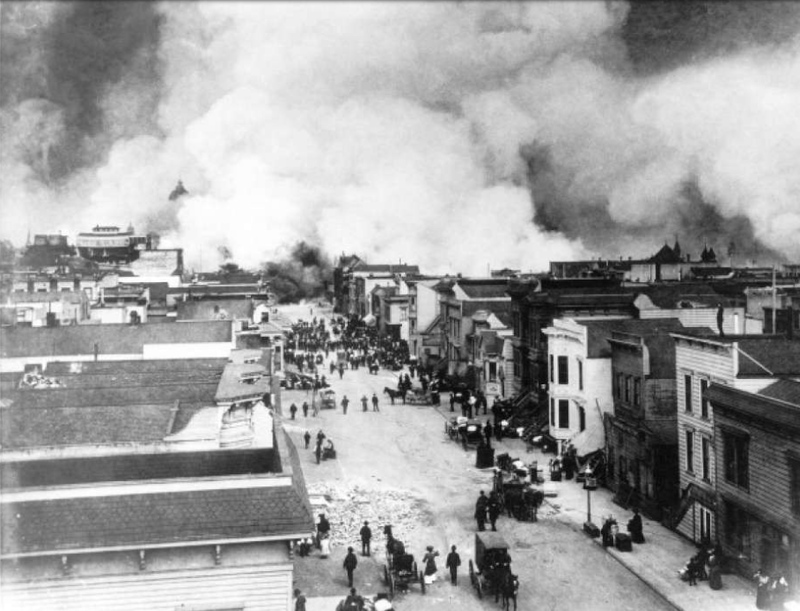 Another major and possibly the most infamous quake to rattle the Bay Area hit in 1906 and the day wasn't marked by typical "earthquake weather" with a temperature of 62 degrees. But a 1989 article in the San Francisco Chronicle comparing the '89 and '06 quakes notes that the day before the '06 quake struck, the weather was "warm and hazy -- exactly the same kind of weather the Bay Area had Tuesday [the day of the '89 quake]," the story reads. "The old timers used to call it 'earthquake weather.'" While these associations between major earthquakes and the weather are often made, Pollitz emphasizes the sciences doesn't support it and says one of the emeritus scientists from the USGS took on the project of compared all the Magnitude-2.0 and above quakes along the San Andreas Fault with temperature, rainfall and atmospheric pressure records. "He didn't find any correlation with any of these things," he says. "That's the stark reality of analysis." While scientists seem to agree that immediate atmospheric conditions aren't a precursor to major earthquakes, they have conducted some research indicating that some extreme weather events may play a role in causing earthquakes in the future. "Short term changes don't have an impact," says Pollitz, "but there might be a statistical correlations for very long-term seasonal changes." Pollitz says researchers have studied a number of more extreme and long-term weather events such as hurricanes, typhoons, droughts and periods of heavy rainfall to determine whether they have any impacts on the occurrence of earthquakes. A team of U.C. Berkeley seismologists released a study earlier this year indicating that more small earthquakes occurred on California faults in years with a larger snowpack when the seasonal flux between snowfall and snowmelt is at its greatest.